The West of Scotland Masters tournament was held at Newlands Tennis and Squash Club on 6/7 December. The tournament was sponsored by e-max. There were a total of 54 competitors who took part in 7 men’s events. Unfortunately there were insufficient entries to hold any ladies events or men’s O40 and O70 events. 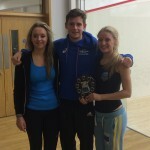 Emilio Fazzi and the Newlands Squash Club committee managed a very well organised tournament. They all worked hard to make all competitors welcome and at the prize giving competitors thanked Emilio and the committee for all their hard work. Thanks are also due to SSRL (Ross Cairns) and Ernie Cowell for managing the draws and supporting the Newlands committee in running the tournament. Mike Halpin and John Crawford deserve thanks for providing marking services on both Saturday and Sunday. Alex Sinclair and Ernie Cowell quickly assessed the West of Scotland results and updated the Masters Tournament Points. Alex emailed the updated Points to his Masters distribution list of about 350 players who have participated on the Scottish Masters circuit over the previous 10 years’. This was an excellent match of high quality with both players taking the ball early and moving each other around the court. Steven won the first game but Simon replied by winning a tight second game. Steven took the initiative and won the third game but again Simon showed his fighting spirit to win the fourth game and take the match to a fifth game. The spectators were enjoying the contest as both players were taking every opportunity to play winning shots. The fifth game was very close and Steven was leading 7-5 when Simon fell heavily and damaged his right hand on the side wall. He took a three minute break but he was clearly in pain. Steven closed out the fifth game 9-5. It was very unfortunate that the game ended with an injury to Simon. This was a tremendous game played competitively, and excellent sportsmanship was displayed by both players. Steven Polli was a full Scottish Squash Internationalist having played at Newlands Squash Club over 30 years ago. He is still playing squash in America and combined a visit home to Scotland with playing in the West of Scotland Masters. Steven was encouraged to enter further Masters’ tournaments in Scotland in the New Year. This was the last match to finish on Sunday afternoon. Both players had won hard fought semi finals earlier in the day. Mark James won the first two games but Andy fought back strongly to win the third and fourth games including saving a match ball in the third game. The match was played in very good spirit despite the need to change the referee! The fifth game was very close before Mark regained control and deservedly won the fifth game with some excellent winning drop shots. There were seven competitors with Andrew MacBean being the number 1 seed. Saturday saw some good matches with all the seeds winning except for John Kynoch. Niall Morris dispatched Craig Duff 3/0 and although there were some good rallies, Niall was always too strong at the end of each game. Peter Buchan had a good match with Sue Dalrymple, who was playing very well. However, Peter was just that bit too strong at the end of each game to win a close 3/0. The surprise match was John Kynoch losing against Angus Woodward, although John was struggling slightly with a leg injury. Angus was too strong and kept the pressure on John at all times winning in the end comfortably 3/0. The semis saw Andrew play Niall in a hard hitting match. Unfortunately Niall could not compete with Andrew and struggled to put his opponent under any real pressure. Andrew comfortably won 3/0. In the other semi final it was a much closer affair! Angus Woodward started quickly and was 2/0 up on Peter Buchan, who looked like he was struggling from a good night out in Glasgow. However, he managed to find his running form in the third and started to compete in the rallies. He eventually turned the match round and came through to win an excellent match 3/2. The final was probably a match too far for Peter against Andrew MacBean. Peter competed well in the first game but at 6-6 the wheels came off. Andrew showed no mercy and deservedly won 3/0. Craig Duff played well to be beat Sue Dalrymple 3/0 in the Plate Final. There were six competitors – two round robins followed by semi finals and final. Andrew McCulley and Mark James won the round robins with David Lindsay and Craig Mitchell runners up. In the semi finals Andrew beat Craig Mitchell 3/0 and Mark beat David Lindsay 3/2 – both tight matches. In the final Mark beat Andrew 3/2 in the Sunday ‘Match of the Day’. There were 13 competitors and this was the most competitive age group. On Saturday morning the pick of the first round matches was a 3/0 win for Jimmy Wells against Graham McAinsh. In the quarter finals Steven Polli beat Simon Gogolin 3/2 in ‘Match of the Day’ and Russell Hunter beat Ronnie Carter 3/1 in a very close match. Chris Holt won convincingly 3/0 against Rolf Hansen and Brian Robertson beat Jimmy Wells 3/1 in a long competitive match. On Sunday morning in the semi finals Steven Polli played all his shots and beat Russell Hunter 3/0. Chris Holt played well, taking the ball early and consistently hitting good lengths and proved too strong in beating Brian Robertson 3/1. In the final Steven Polli, again played well and won 3/1 against Chris Holt who fought hard for every point. In the Plate final Graham McAinsh beat Danny Russell 3/1. There were eight competitors. On Saturday morning there were some good matches with top seeds Neil Rayner and David McAleese beating Kenneth Mitchell and Richard Easton in competitive matches. There were excellent wins for Norman Paterson beating Martin Sullivan 3/1 and Alan Susskind beating Keith Gristwood 3/0. In the semi finals Neil beat Norman 3/0 and David beat Alan 3/0. David McAleese played very well against Neil Rayner and won a competitive final 3/0. Keith Gristwood beat Kenneth Mitchell in the Plate Final. There were 11 competitors. On Saturday morning there were good wins for Emilio Fazio to beat Ernie Cowell 3/2 and for Eric Donohoe to beat Dave Sturman 3/1 and both reached the semi finals. Local man, John Pinkerton played well but eventually lost 3/2 to Jim Dougal and John Rae beat Walter McAllister 3/1. In the semi finals John Rae beat Emilio 3/0 and Jim Dougal beat Eric Donohoe 3/0. The final was, as usual, a competitive match of contrasting styles between Jim Dougal and John Rae. Jim played all his shots to take a two game lead before John showed his superior fitness to win the third game. However Jim took a good early lead in the fourth game and held his nerve and deservedly won the match 3/1. Dave Sturman beat Iain McLean 3/1 in the Plate Final. There were nine competitors. In the quarter finals on Saturday morning Ian Ross and Alex Sinclair beat Ken Reid and Roy Gordon, both from Oxford in competitive matches. It was great to see ‘veteran’ Masters competitors, Alex Everingham and Donald Shearer both playing well to beating Chris Jeffrey and Warren Cameron to reach the semi final. In the semi finals Ian beat Donald 3/1 and Alex Sinclair beat Alex Everingham 3/1 – both tight matches. In the final Ian Ross won the first game, with Alex Sinclair fighting back to win the second game. Ian won a tightly contested third game and then won the fourth and the match 3/1. Ken Reid beat Roy Gordon in the Plate Final.